The share of employees quitting their jobs compared to total separations is back at post-recession highs. The Bureau of Labour Statistics on Wednesday released its Job Openings and Labour Turnover for August. One reason economists pay attention to this report is that it contains the quits rate, which Federal Reserve Chair Janet Yellen endorsed as a preferred metric. 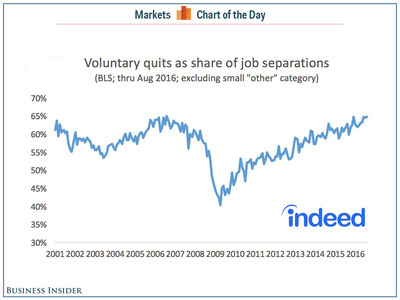 Quits, or voluntary resignations, fall under the bigger umbrella of separations which also includes layoffs and discharges. In August, the quits rate — the number of quits divided by the number of employees who worked or were paid for work — was 2.1%. And, the share of total quits in relation to separations — voluntary or not — jumped to 60.2%, matching the post-recession high reached in December. A higher quits rate sends a positive message about the labour market because people are more likely to quit their jobs if they feel confident about finding a new one quickly, or if they already have another offer. It could also suggest that workers are leaving their jobs for better-paying ones, and so be a predictor of wage growth and inflation. Jed Kolko, the chief economist at job-search portal Indeed, shared a chart illustrating the metric on Twitter. The JOLTS report showed that job openings fell to 5.4 million. Economists had not expected a drop that big, but it was an expected pullback that followed a surge to record highs in recent months.